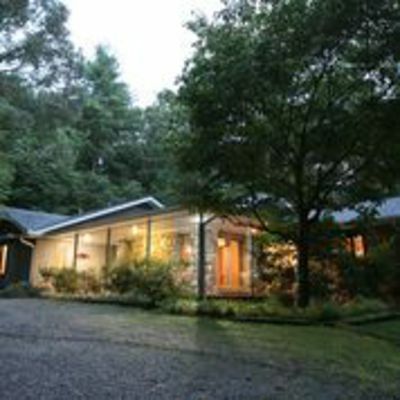 This new listing is in the Thomas Woods subdivision of Pisgah Forest, North Carolina. It's perfectly situated on more than 4.5 gentle acres, has a beautiful pond and it offers peace and quite with plenty of privacy and only 8 minutes drive to downtown Brevard. This home is ready to move in immediately and features many modern updates. It has a modern color scheme. Fresh paint inside and out. The roof is less than 5 years old and the home is in perfect condition and clean as a pin! Great for entertaining guests or raising a family. Im sure your going to enjoy the huge private deck off the main living areas as much as you will enjoy watching the children play from your large covered rocking chair front porch overlooking your estate. The main level features 3 bedrooms with 2 baths and I would like to add that the master suite is huge. The cook of the family will love the updated eat in kitchen featuring custom cabinetry and solid surface countertops with plenty of storage and beautiful hardwood floors. There is a large formal dining room and the focal point of the living room is the wood burning, stone fireplace. Moving downstairs your family with have plenty of room to stretch out! We have a bonus room currently being used as a 4th bedroom, a game room with a wet bar, family room, full bath and a second bonus room that would be perfect for a guest room or small office. Privacy without seclusion, a beautiful home on a beautiful piece of land. Pisgah Forest, North Carolina is in Transylvania County and is only minutes from Brevard and located at the foothills of the Blue Ridge Mountains at the crossroads between Pisgah National Forest, DuPont State Forest, and The Gorges State Park all offering a smorgasbord of outdoor activities such as world-renowned fly fishing, kayaking, biking, hiking, camping and climbing. Brevard is also home to the world-renowned Brevard Music Center, Brevard College, and Transylvania Community Arts Council, bringing very diverse programs, concerts and exhibits to our mountain community. Brevard’s hometown feeling is captured by four annual street festivals: White Squirrel Festival, the famous Fourth of July Festival, Halloween Fest, and the Twilight Tour. These include special events such as the Annual Squirrel Box Derby, antique auto show, Old Time Music Competition, and Main Street Alive. The city is nicknamed “The Land of the Waterfalls” due to the many waterfalls in the area, including Looking Glass, Connestee Falls, and Sliding Rock.